Annual Investigator Initiated Research (IIR) Grants: This program’s objective is to stimulate and fund studies that will clearly improve patient safety and lead to prevention of mortality and morbidity resulting from anesthesia mishaps. Potential areas of research include a wide variety of safety patient topics. Research Areas: Clinical and educational research and development in anesthesia patient safety. See Areas of Research for more details. Eligibility: Awards are made to a sponsoring institution, not to individuals or departments. Any qualified member of a sponsoring institution (hospital, university, clinic, etc) in the United States or Canada may apply. Amount: Maximum award of $150,000. The maximum indirect cost rate is 15% of total direct costs and must be included in the total $150,000 maximum award. Research Time The amount of time devoted to different projects is variable, but in most instances, 10-30% effort (research time) is appropriate. Awards are made to a sponsoring institution, not to individuals or departments. Any qualified member of a sponsoring institution (hospital, university, clinic, etc) in the United States or Canada may apply. Only one person may be listed as the principal investigator and all other co-investigators, collaborators and consultants must be listed. Applications will not be accepted from a principal investigator currently funded by the APSF. While there is no limit to the number of applications that may be submitted per individual or institution, APSF will award funding to no more than one proposal per PI in a given funding cycle. Submissions of previously unfunded applications are allowed but must address the reviewer’s comments and how the re-application differs. The maximum award amount is $150,000 for the entire term of the project. The maximum indirect cost rate is 15% of total direct costs and must be included in the total $150,000 maximum award. The number of grants to be awarded will depend on the nature and quality of applications received and the total amount of funds available. Projects may be for up to 2 years in duration. The amount of time devoted to different projects is variable, but in most instances, 10-30% effort (research time) is appropriate. In the first stage, Letters of Intent (LOIs) are being solicited for research and development on anesthesia patient safety that is related to identifying the causes of preventable injuries and errors. Research proposals will be evaluated primarily for a potential contribution to patient safety, and subsequently for scientific merit, feasibility, and applicability. 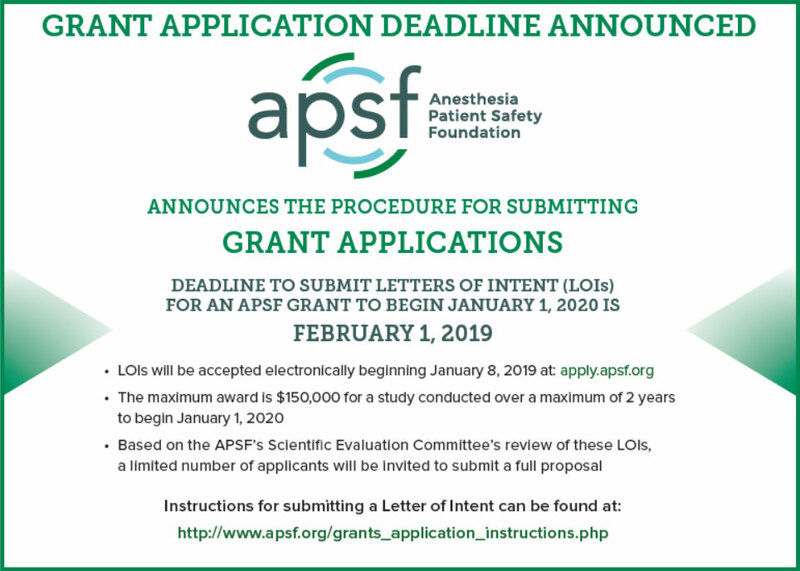 Based on the APSF’s Scientific Evaluation Committee’s evaluation of these LOIs, a limited number of applicants will be invited to submit a full proposal. Poorly conceived ideas, failure to have a clear hypothesis or research plan, failure to demonstrate clearly the relationship of the work to patient safety, or failure to describe methodology (including power analysis) are the most frequent reasons for applications being disapproved or receiving a low priority score. 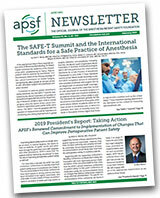 Studies of implementation of known safety ideas to a wide audience. While projects that promise improved methods of patient safety with a defined and direct path to implementation into patient care settings are encouraged, of equal importance are studies of problems for which deeper understanding is needed before effective solutions can be applied. Innovation and creativity are strongly encouraged, as are cross-disciplinary research teams. Because the resources of APSF are limited, priority will be given to topics that do not have other available sources for funding. Junior investigators with strong mentorship are encouraged to apply. Proposals whose results would not have a clear and direct link to near-term improvements in clinical care and patient safety. Proposals that seek to develop products or equipment for commercial purposes. Basic science proposals involving cells, tissues, or animals. Whole animal studies may be considered, but only in the rare circumstance in which an alternative testing of a critical patient safety hypothesis in human studies is not feasible. Research proposals that have other available sources for funding. Proposals to create patient safety education curricula or that propose methods that do not include a rigorous evaluation of content validity and/or benefit. Unrevised resubmissions of applications not invited to submit full proposals in a previous year. Cover Letter: On letterhead of the institution that is sponsoring the investigation. Title and Principal Investigator (PI): Include title of the project, the credentials, title, office address, and email address of the PI, and the PI’s primary institutional affiliation. List only one person as the PI. Identify all co-investigators, collaborators, and consultants as described below under Qualifications of Key Individuals.Executive Summary: Summarize the project. Limit to one paragraph.Background: Describe the problem, existing knowledge about it, its importance to patient safety, and its relevance to the goals of the APSF. Limit to 2 paragraphs.Specific Aims: Describe what you are proposing to accomplish toward addressing the problem, i.e., what are your goals and objectives? What hypothesis will be tested?Methods: Describe the methods that will be employed to study the primary hypothesis (i.e., that used for the power analysis). Be as specific as possible without unnecessary detail. This section is important and should be detailed enough to explain the methods that are being applied for analysis of the primary endpoint. Statistical collaboration is encouraged. Impact: Describe how you expect the results will be used and what impact could they have in addressing the problem. Estimated Budget and Timeline: Detail the estimated costs and indicate any funds that will be provided by the institution or other entities. Outline the timeline for completion of the work. Qualifications of the Key Individuals Involved: Include a CV or biographical sketch of the principal investigator and (optionally) of one co-investigator; see below. Name other members of the research team, which should include persons from the appropriate disciplines; interdisciplinary teams are strongly encouraged. Comment on institutional support and any special characteristics. Curriculum Vitae: Include a CV or biographical sketch of the principal investigator (2 pages maximum), listing only most relevant publications. A CV of one co-investigator (2 pages maximum) may be included if this is deemed necessary. Name other members of the research team under Qualifications of Key Individuals; see above. Bibliography: Include the references of publications relevant to proposed study (one page maximum).Do not attach any appendices. They will not be forwarded to reviewers.Applications that do not adhere to these instructions will be returned without review. Members of the APSF’s Scientific Evaluation Committee will evaluate the LOIs. Investigators will be notified of the status of their LOIs in June 2019. In the second stage of the process, a limited number of applicants will be invited to submit a full proposal, for which more detailed instructions will be provided. The comments from reviewers must be addressed in the full proposal. Major changes in methods from the LOI to the full proposal (e.g., number of participants upon which power analysis was determined) that are not requested by the Committee may not be accepted. Full proposals will be due in early August 2019. Those invited for full proposal submissions will be given instructions to electronically submit full proposals. At the applicants request, the Scientific Evaluation Committee will provide a brief critique of LOIs that are not invited to submit a full proposal. Awards for projects to begin January 1, 2019 will be announced after the annual meeting of the APSF Board of Directors meeting in October 2018 at the ASA in San Francisco, CA. Note: No award will be made unless a copy of the APPLICATION to the institutional review board (IRB) or animal studies committee (ACUC) is received prior to October 1, 2018. Institutional approvals are required prior to disbursement of funds. Further information about the Grant Program and applicant eligibility may be found at Frequently Asked Questions.